The western forests guard their secrets well. One of these is Lyralei, master archer of the wood, and favored godchild of the wind. Known now as Windrunner, Lyralei's family was killed in a storm on the night of her birth--their house blown down by the gale, contents scattered to the winds. Only the newborn survived among the debris field of death and destruction. In the quiet after the storm, the wind itself took notice of the lucky infant crying in the grass. The wind pitied the child and so lifted her into the sky and deposited her on a doorstep in a neighboring village. In the years that followed, the wind returned occasionally to the child's life, watching from a distance while she honed her skills. 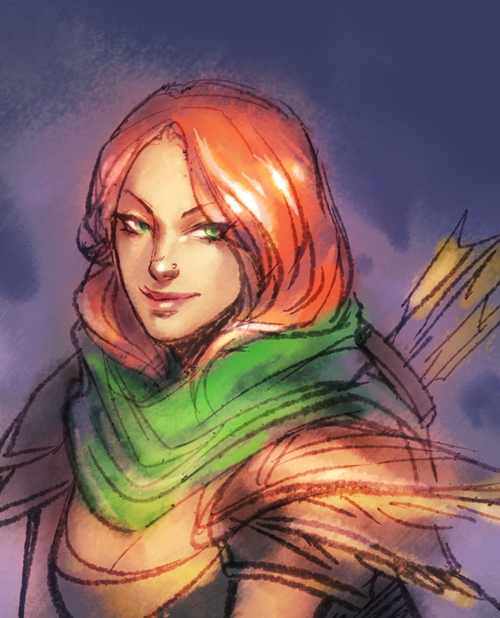 Now, after many years of training, Windrunner fires her arrows true to their targets. She moves with blinding speed, as if hastened by a wind ever at her back. With a flurry of arrows, she slaughters her enemies, having become, nearly, a force of nature herself. Alleria the Windrunner is one of the best Int hero on the game. She is so useful, in all stages of the game. Strong on early game, very good ganker on mid game, and still strong on the late game on supporting her team. Shackle is her main skill for the teamfight because she can disables 2 enemies in a teamfight which is very annoying to the enemy team. With the long range attack, she can dominate the early game easily. And on the late game, still useful by using hex and shacle. And with a relatively good damage and attack speed, can easily harass enemy in a though teamfight. Shackle is one of the longest disable in Dota, and can disable 2 target. Needs lot of mana to use her ultimate. Powershot is not a targetted spell, so it can miss. Have Powershot that deals high damage in a long area. Windrunner's variety of bow skills includes an arrow with thick ropes attached to encumber any escaping target. This is one of the longest disable in DotA. A 3.75 seconds disable will makes your opponent can't do anything while being harassed by your team. You need a tree or a unit behind the first target to be able to shackle properly. So, aim a target that has a tree or a unit behind him. Or move yourself into the straight line of you, your target, and a tree/unit. Windrunner charges her bow for up to 1 second for a single powerful shot. The arrow deals damage to enemy units and destroys trees in its path. Damage is greatest on first target, and reduces by 10% for each target it pierces thereafter. If the channeling is cancelled early, the shot will still occur but deal less damage. This is your main nuke. You need this to harass, kill enemies and to farm the creeps. A 360 damage ultra long range AoE damage is a very good thing from this skill. You can kill a waves of creeps easily with this skill. This will faster your earning to makes you get some gold to buy at least a Sheepstick. And this skill also makes you possible to harass enemy from far far away and keep their Hp reduced. Constant harassment is needed for early game to make enemy can't farm properly and your team can get more gold than the enemy. This skill is also a very good killing skill. With a high damage, you can kill enemy heroes from many range. Aim your target and shot! Bingo!! you got the streak . Can also kill enemy in the fog. It will become epic. So maybe you can send your video to WoDota or something. True to her namesake, Lyralei enchants gusts of winds to flight incoming attacks. Got increased movement speed and also be immune of physical attack. So useful to fight 1 on 1 vs physical attack. Or to run away from enemy that tries to kill you. Or to chase enemy that tries to run from you / your team. Or to faster your movement through the map. Cast this on a though teamfight to be able to survive from physical attack. Recommended to cast this after all magic is come out and enemy' carry start to attacking you, so you can block their physical attack. Windrunner channels the wind, gaining maximum attack speed on the enemy unit or structure, although with reduced damage, including damage from Unique Attack Modifiers and item effects. Once Windrunner switches targets, the speed is lost. Lasts 20 seconds. Upgradable with Aghanim's Scepter. A skill to increase the attack speed into maximum attack speed for a single target. Unfortunately, with a reduced damage. A good skill to focus fire on a target and tries to kill him in a teamfight. or Windrun if you don't need to get firstblood but need a protection from a firstblood attempt. Why maxed Powershot first? This is your main nuke, you will need this for ganking, farming, and killing on the early-mid game. Why maxed Shackleshot before Windrun? Shackleshot is the main skill to disable the enemy team. This skill is very useful because your team needs the disable to kill/gank the enemy. And also, a level 1 Windrun is enough for early game. On early game, you have the ability to harass the enemy hero in your line. So keep harassing your enemy using a normal attack and sometimes you can also use the Powershot. Windrunner is also a hero that have a very nice attack animation, so last hits will be easier for you, your arrow will quickly hits the low Hp creep as you wish. 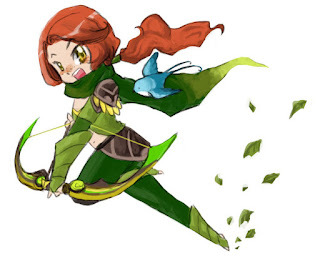 As a defense, Windrunner can use the Windrun to run away from enemy's gank, or if Windrunner wants to keep fighting, it is a good thing too, because the Windrun skill gives a physical damage block. And if your team wants to try to kill the enemy, you can use Shackleshot to help disabling the target, and then Powershot will deal the damage to successfully kill your enemy. Mid game is usually the time for ganking all around the map. And your part here is to participate in the gank party together with your friends. The main skill for you is Shackleshot. This skill will ensure a long disable for your team so you and friends can easily harass and get many kills. The most important thing to remember is to place yourself, your target, and a tree/unit in a straight line so your shackle can last long and disable properly into the enemy. And if you are not in the position of a straight line, you should move yourself to the right or to the left and then you should Shackling the target. Hope you can do it correctly so your team can attack the target conveniently. After you succeeded in Shackling the target, you can then use the Powershot, normal attack, or Focus Fire to beat your enemy. And if you are fighting with a physical attack, you can use Windrun to evade the attack. If you lose the fight, Windrun can also saves you and make you escape safely. If there is enemys wave coming to your base, always use the Powershot to kill the creeps and harassing the heroes. It will reduce the waves power. On the late game, you should still become the big part for your team. Keep in mind that Shackle is one of the main disable for your team. On the late game, with all the heroes become strong, 2 shackled enemy is a big matter for the enemy team and this is your job to shackle them. Usually, Windrunner player also buy a Sheepstick, this will add one more disable in your pocket. So you can disable a maximum of 3 heroes in a teamfight. Although it is almost impossible to disable 3 heroes in a moment, you should try your best, aim the Shacke carefully and also don't forget your Sheepstick to Hex a hero. Your Focus Fire also reach its maximum potential here, so aim a target and keep harassing and killing him. Passive: Basilius Aura - Grants mana regeneration and armor in a 900 AoE. Multiple instances of Basilius Aura do not stack. Why Ring of Basillus? Gives you attack damage, mana regeneration, and bonus armor. Attack damage to last hits and harassing, mana regeneration to always fulfil your mana to use Powershot, Shackle, or Windrun, amd bonus armor to help you reduce the damage you receive. Active: Phase - Gives increased movement speed and lets you move through units. Phase is cancelled upon using another item or ability. Why Phase boots? Gives you attack damage, and gives phase skill (+ms and can walk through creep/heroes). 5. DPS Item is needed because you have a Focus Fire that attacks with maximum speed. So damage is a complete synergy of the Focus Fire. DAEDLUS: Daedlus will provide you with a powerful Critical Strike. So if your normall attack not trigger your ultimate, deadlus can still provide you with a critical. Passive: Chain Lightning - Grants a chance to release Chain Lighting on attack, dealing damage to multiple targets. Manacost: 50 Cooldown: 35 Active: Purge - Purges a target unit, removing buffs, slowing, and dealing damage if it is a summoned unit. This item is always good for a carry, because carry need to deal more damage, and with the minus armor, the damage will be amplified Why Mjolnir? Mjolnir increases attack speed by a lot. This skill also gives the Lightning ability. Very good item to hold as a carry. Why Diffusal? This is considered a good item for a carry. It gives additional pure damage and the orb effect to reduce enemy's mana with each attack. Diffusal also gives a Purge ability that can be used to slow down enemy. Beware of Silence because you use skills to attack the opponent. If you cannot use your skill, you become weak and can easily harassed. You are not so tanky hero. Although you have a physical immunity skill, but a high instant spell damage will be so painful for you.